Visiting a sugar mill on the coast of Barbados, I wondered how far humans are willing to go for the everyday resources I take for granted. What are we willing to do to the environment or other human beings for sugar, salt, and electricity? 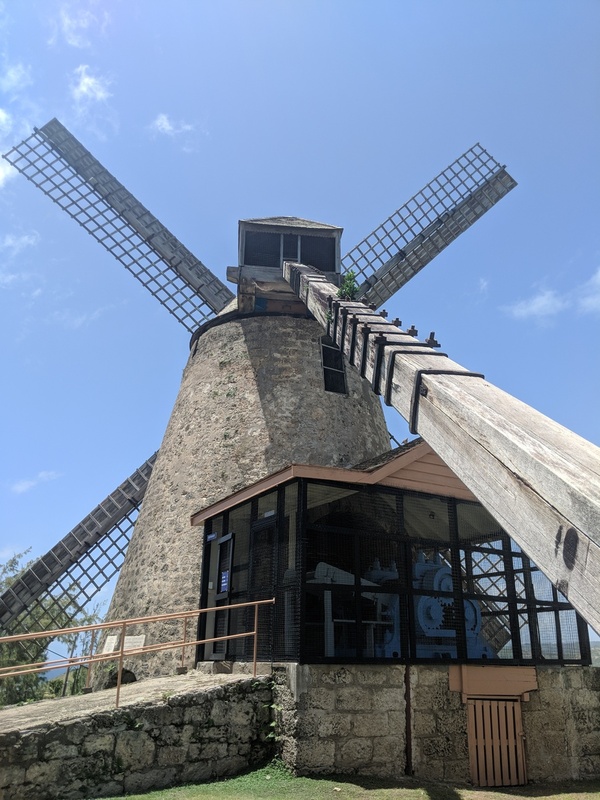 In this image, you see the only wind-powered sugar mill still operational on Barbados from the 17th and 18th centuries. These sugar mills once existed by the dozen across the island of Barbados, acting as the technological backbone of the lucrative sugar industry. I focused in on the backside of the windmill because this is where you can see the reasonably advanced technology behind a brutal enterprise. On the tour, our guide pointed to the long wooden rod and noted that six to eight female slaves would have to lift and move this rod until the windmill was most efficiently moving in the wind. Weighing hundreds of pounds, I wondered if a more technologically advanced mechanism would have removed this burden… and if the development of technology would have eventually eliminated the need for slave labor altogether. But in this moment, I thought of Eli Whitney and his cotton gin. Invented with the hope of reducing the demand for slave labor, the cotton gin only made harvesting cotton more urgent. With sugar as one of the main staples in my American diet, I can only imagine that the demand for sugar has increased in recent years. Though my hope is that there is no place in the world today where the life expectancy of a laborer is only three years like that on these plantations… I do feel the need to consider who bears the burden of the resources that support my life. Does technology reduce the burden or simply shift the burden somewhere else? Did the development of the sugar mill reduce the cruelty of the slave trade or make the task more urgent? How far are we willing to go for our resources in modern society?